This weekend I was out in Norway for a family birthday so it gave me a great opportunity to have a go at a wine from the Vinmonopolet. Those of you who don’t know, people in Norway have to buy their wine from government shops. On the upside you get a huge choice from all the way around the world, on the downside the choice is their choice, not yours. When it came to Chilean Merlot for example, there were (I think I’m right in saying) 50 different ones on offer. Not sure what the point of that is in fairness, but at least I managed to get hold of one without much hassle. 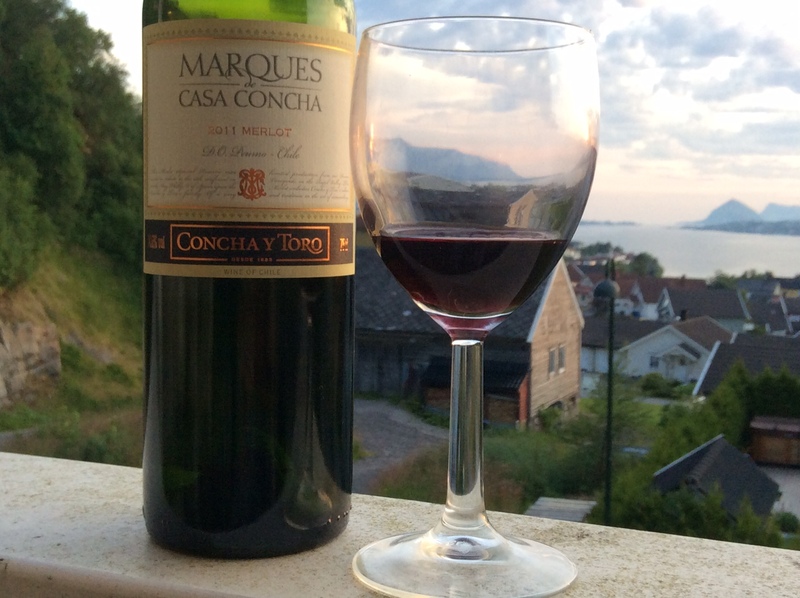 We had a bottle from the Chilean megalith brand of Concha Y Toro on Sunday night (the Marques de Casa Concha range), with the wife’s brothers and their girlfriends. I started the stew a bit later than I wanted, but fortunately the world cup final went to extra time, so the extra 30 minutes just about sorted it out. We did the usual and tried it without food first. It was very deep coloured, with big tinges of purple in it, kind of indicating what was coming up. Anything with big tinges of purple is usually young and fruity. Usually. Well that’s exactly what we got here. Smells of damson and sour blackcurrant and not much else was followed in the mouth with what was a pretty sour finish. Medium bodied as expected, the tannin (the grippiness round your gums) was really noticeable, even though I’d let it breathe in a water jug for a couple of hours (which usually eases that up a bit). Decent acidity balanced out the sourness of the fruit, but it felt a tad too alcoholic (a bit warm on the throat) on the finish despite only being 13.5%. With the food though, it did change its tune. 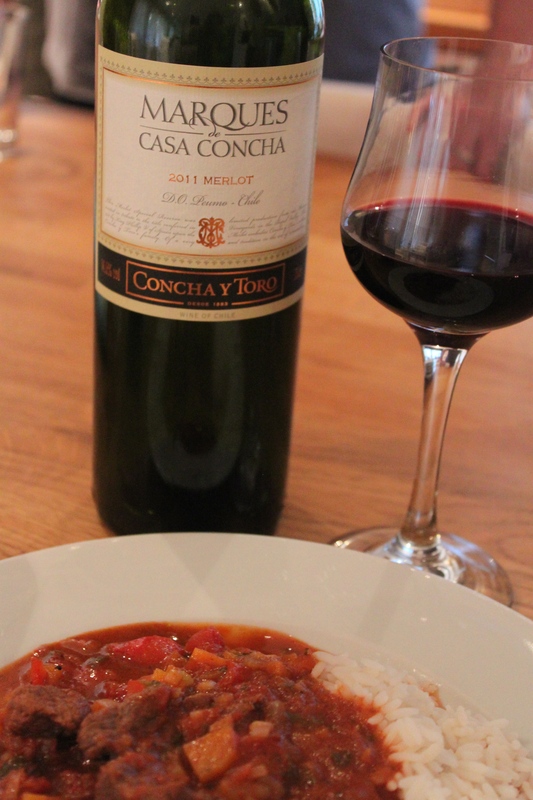 The sweetness of the roasted peppers and tomatoes in the sauce lightened up the sourness and the tannins, which pretty much flattened this wine off into a very easy going fruity wine with the meal. All’s well that ends well. A decent “without food” 5/10 became a good “with food”7/10. I don’t think I’ve given Chilean Merlot enough of a chance this week, so I’ll be having a look to try it further when I get a chance over the coming weeks. Special mention this week goes to my brothers-in-law who despite not actually drinking wine (they’re all these weird kinds of people called athletes! ), broke their ban and gave it a taste with us. Cheers lads, much appreciated! Hope you guys all enjoyed yourselves. Isn’t it funny how different countries have different regulations about buying alcohol – here you can buy it 7 days a week at so many different outlets. I would love to try wines from different parts of the world – just too expensive for me here in South Africa.